The Paul A Keenan Memorial Foundation’s Animal Rescue Project is transporting & fostering dogs from southern states, whose animal rights laws do not adequately protect dogs & cats from euthanasia, overcrowding, cruelty & abuse, hoarding, neglect, etc. We bring them to northeastern states, which do a better job at caring & loving pets. Right now, our rescued dogs are in loving foster homes. We brought up from Woodstock, GA, four seven-week-old chow chow puppies, adorable fluff balls, three beige boys & a black girl. Their first day here was spent at their new vet; see their next day's photo shoot results below; then spent the next day at an afternoon holiday party with ten children, youngest 3 & oldest 16! Just like babies, they are up at midnight & then again at 4 am! Upcoming adventures of the chow chows include their turn to go shopping, When the puppies are not yet ready for their debut on a leash, their foster mom wraps them up like a baby in bunting and carries them through JCPenney and stores they will visit when they are ready for paws on the ground for a shopping experience. As they grow and graduate to walking on a leash, their adventures take them to Evergreen Walk and area pet stores. 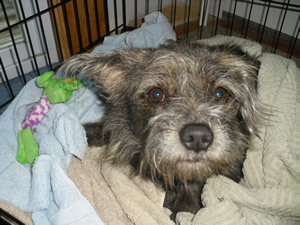 Two days later, we sponsored & rescued a very scared, two-year-old, gray, scruffy, terrier doggie, Champ, transporting him from WV. He was in a pound there, then a foster home that could not keep him through the holidays. He has been to emergency and is now being cared for bleeding, swelling & lethargy. Within two days, he was eating chicken & rice out of his foster mother’s hand & giving tons of puppy kisses. They know when they are safe & loved! Then just days later, we adopted out a pug/chihuahua mix, seven-month-old, 12-pound, tricolored tan/yellow/fawn doggie to an excited young couple with a ten-month-old daughter as a Christmas gift to themselves. Guess what his name is? Paul! He may be called Winston Paul at his forever home. 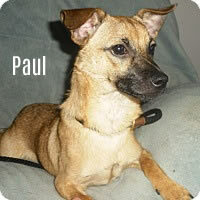 The latest: a woman attorney also wanted to adopt Paul, so Perry & Paul both have homes. 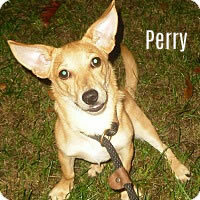 You can see our doggies that are ready to be adopted at AdoptaPet.com.